I follow the bend around and look at Hambledon Lock and Hambledon Mill. 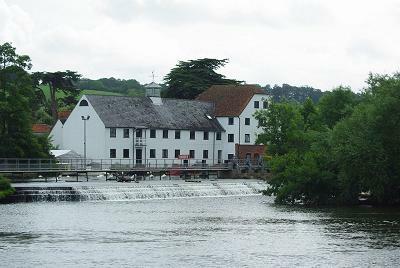 The mill can be reached by crossing the lock and then following the walkway along the top of the weir. Hambledon Mill is a popular subject for photographers with its large white walls and river frontage. I take a few snaps of my own, and then return over the lock to continue my walk towards Aston Ferry. At Aston Ferry the traditional towpath takes another one of its trips to the opposite bank for a while. 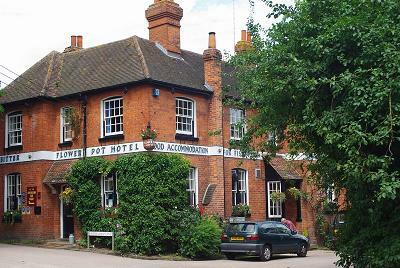 The Thames Pathway follows a narrow lane and climbs up to the hamlet of Aston, and The Flowerpot Hotel. From the outside the hotel looks like one of those places that time has passed by. It probably looked exactly the same in Edwardian times. A large sign painted along the side-wall announces “Good Accommodation for Fishermen and Boaters”. Walk inside and a wonderful Aladdin’s Cave opens up. The walls are adorned with specimen fish set in glass cases and all sorts of other paraphernalia fill the gaps. It could take a few good drinking sessions to examine them all which is as good a reason as any for a return visit. Actually I will correct that. It is only a second good reason because the menu board is packed with mouth-watering dishes that have me positively drooling and making a note to come back in the future and bring the dearly beloved for a meal. (We returned in the autumn and it was well worth it). The pathway turns off the narrow village road and runs parallel to the river, offering spectacular views down to the waterway and the fields beyond before heading back downhill to meet the river again.